This course will present winning strategies for classroom management in an age of high-stakes tests and school violence. 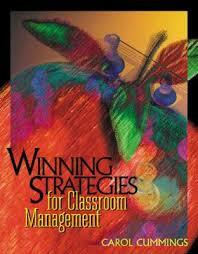 Maintain a purposeful and supportive learning environment at all times with the comprehensive approach from this book. Seeking self-discipline, learning how to learn, and preventing misbehavior are a few of the many topics in this book. Discover classroom-proven practices that help reduce stress as you develop your students' learning skills. Educators will examine how discipline relates to standards and how school changes such as multi-age classes, looping and blocking increase the need for better management. Teachers will learn how changing schools, diversity and inclusion require better class management skills for today's classroom. State or district standards are also reviewed. Educators will look at similarities between skills employers demand and the self-management skills taught in an effectively managed classrooms. Students will examine numerous figures and charts that provide strategies for addressing behaviors in classroom and school settings. Teachers will learn to integrate self-management, learning to learn as well as how to proactively prevent misbehavior in classrooms and school settings.